Keratoconus leads to reduced vision. This is because light enters your eye through the cornea, which bends it so you can see clearly. If your cornea is distorted, the light doesn't bend correctly. 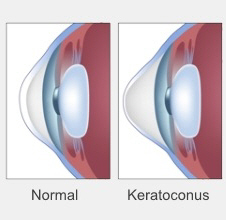 Most people get keratoconus in their late teens to early 20s, although it can begin at any age. However, it rarely starts after the age of 30. Keratoconus generally gets worse over time, but this can happen quickly or slowly. It may affect only one eye but more commonly it happens in both eyes. We don't know. We do know that it runs in families, and many people with keratoconus say they have rubbed their eyes a lot. Many people with keratoconus also have allergies and eczema, but we don't know what the link between them is. are less able to repair themselves when they are damaged. If you have mild keratoconus you might be able to see well enough with glasses. As the keratoconus progresses and your cornea becomes increasingly distorted, specially designed soft lenses can work well. As the keratoconus becomes more advanced, rigid, gas permeable (hard) contact lenses are usually the best choice to correct your vision. Fitting contact lenses can be time-consuming. You can expect to have to go back to your optometrist several times to fine-tune the prescription and how well the lenses fit. This could even take several months. A procedure called corneal collagen cross-linking may also help to stop the keratoconus from getting worse. This procedure uses eye-drops and ultraviolet light to strengthen the collagen in your cornea, so it holds its shape better. Collagen cross-linking doesn't cure keratoconus, but it does stop it from getting worse. You will still need glasses or contact lenses after treatment. Another treatment inserts plastic rings into the middle layer of your cornea to help to flatten it. If you are no longer able to wear contact lenses, or if your cornea becomes scarred, you may be advised to have a corneal transplant. As with all transplant surgery, there is a risk your body will reject the transplanted corneas, but generally this is a successful operation. American Academy of Ophthalmology – What is keratoconus? More information about keratoconus, its causes, symptoms, diagnosis and treatment. An information site for people with keratoconus and their families.